I recently made one of my all time favorite desserts gluten free. It really adapted very well gluten free. I think the gluten free cake was a little bit heavier, but it was very close to the real thing. You could actually use almost any yellow type gluten free cake recipe or mix for this. I decided to just post the cake recipe here, because I have the whole recipe and all the steps posted on my main site. 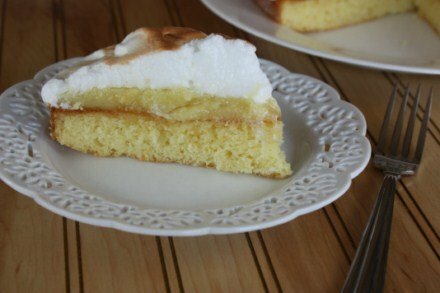 You can go there for the filling and meringue recipe, plus all the directions. In a bowl cream butter and sugar. Add egg and egg yolks. Mix well. In a bowl combine the rice flour, cornstarch, sweet rice flour, salt, and xanthan gum, and baking powder. Add dry ingredients to creamed mixture, alternating with the milk. Start and end with the dry ingredients. Add vanilla. Place batter into a greased and floured 8 or 9 inch round cake pan. Bake at 350 for 25-30 minutes or until done. Let cool 5 minutes and remove from pan to a cooling rack. I love Lemon Meringue pie. Making this as a cake is a fabulous idea! It looks delicious! That looks delish! I too am finding that it’s just easier if I choose my favorite all-time desserts and adapt them to gluten-free as well. My next goals are to take my favorite recipe for cinnamon buns (The New Best Recipes Cookbook) and my favorite pumpkin muffin recipe…and see what happens. I am still working on Cinnamon Rolls also. However, I think I have excepted the fact that gf ones will never be quite the same. This recipe sounds heavenly- I am definately making it! I love almost anything lemon, so it is perfect for me!